Tiananmen Square Post Office, the first regular postal service site in this area, attracts visitors from all over the world with a variety of exclusive souvenirs and personalized services. The office runs from 9 am to 6 pm everyday. It is an ideal place for visitors to have a rest and take a quick glance at Chinese souvenirs. Walking only about 200m out of exit A from the Qianmen subway station, visitors can see the small green post office between two time-honored Chinese restaurants: Quanjude Roast Duck and Donglaishun Hotpot. World-known Chinese director Zhang Yimou, who is masterminding the fireworks evening party on National Day this year, was hired as the honorary chief at the post office. According to a person familiar with the office, Zhang has been added to the post office's list of celebrity partners, although no specific plan for further cooperation has been made yet. Previously an Olympic specialty shop, the post office was redecorated and now has many Chinese elements. A crimson wallpaper covers the wall and greets visitors with the phrase "blessings from Tiananmen Square" written on it in large Chinese characters. Two colorful oil paintings, "The Founding Ceremony of China" by Dong Xiwen and "A Happy Night" by Liu Yuyi, hang on the wall and give tribute to former Chinese leaders, creating a patriotic atmosphere. 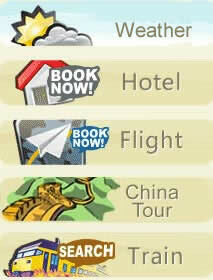 Store manager Liu Yanjun told China.org.cn that the store's main function is to serve national and foreign visitors. 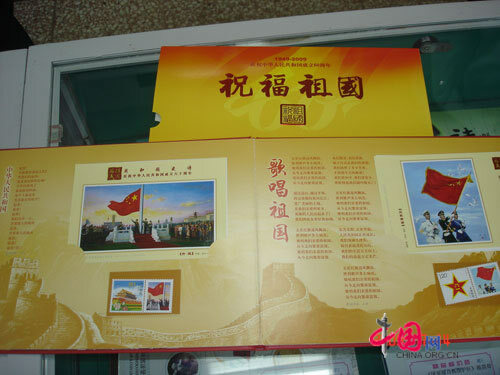 The post office sells various philatelic products, including exclusive Tiananmen post cards. One hot item is a stamp that features four events held at the Square: hoisting the Chinese flag at daybreak, top officials reviewing the troops, the National Day parade and National Day evening party. The stamps are so popular that the store has already run out of stock within its first week of being open. The special stamps cost 60 yuan (US$8.7). In addition, the store also sells high-end collection stamps, worth 4,960 yuan (US$726). Liu said the high-end stamps are also quite popular among customers and that she has already sold seven sets. The store also caters toward international tourists. Visitors can buy international stamps for 4.5 yuan (65 US cents) to paste and send immediately to the one they care for. The office offers bilingual service, as the staff can speak basic English. Liu said new staff who can speak more than one foreign language will start work next week. However, she has not yet been informed of which languages the staff members will be able to offer as a service. Personalized services are also available at the new post office. Visitors can put a certain memorial postcard in a box saying "the square where the Chinese national flag is hoisted" and the addressee will receive the postcard with an "October 1" seal on Chinese National Day. A digital camera and a computer allow visitors to create customized postcards by choosing their favorite background. It costs 10 yuan (US$1.5) and both cash and credit cards are accepted. 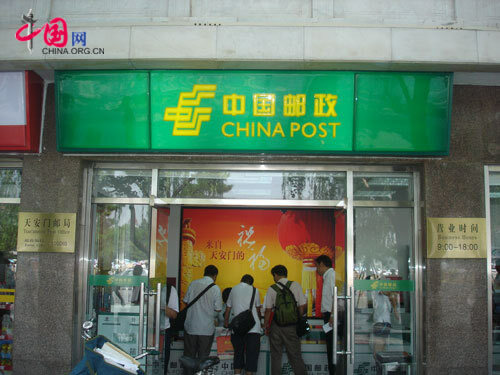 The office's postcode is 100060 – a number that used to service southern Beijing, but was canceled due to an adjustment in the postal system years ago. Typically, postcodes cannot be used twice, but this number was reactivated to celebrate China's upcoming 60th anniversary. At the moment, users can only send regular mail from the new post office. Registered mail, package delivery and express mail services will be available in the near future.